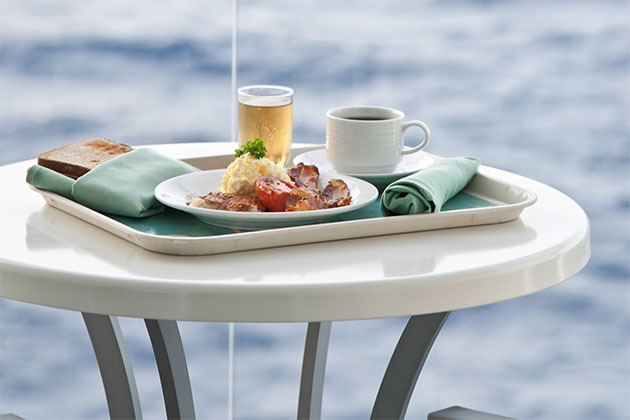 Room service is an amenity that allows passengers to order food to be delivered to their cruise ship cabins. 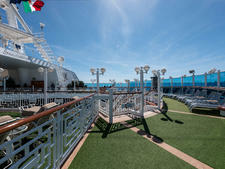 Menus are generally provided in each stateroom. 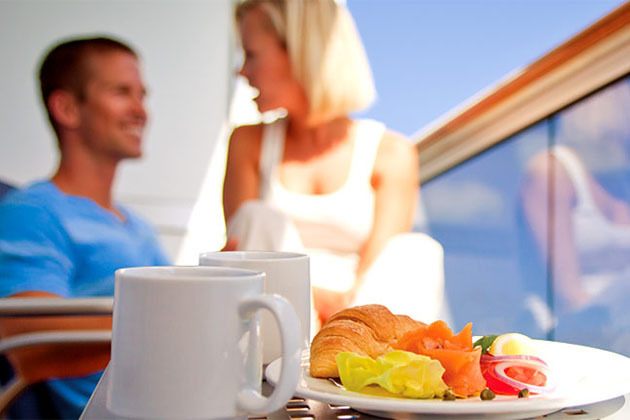 Types of food available for room service vary from cruise line to cruise line and sometimes even from ship to ship or from cabin to cabin on a particular ship, depending on stateroom category. Standard items usually include things like bagels, pastries, eggs and omelets, fruit, hash browns and toast for breakfast, as well as anytime items like salads, sandwiches, pizza, cookies and a variety of drinks. 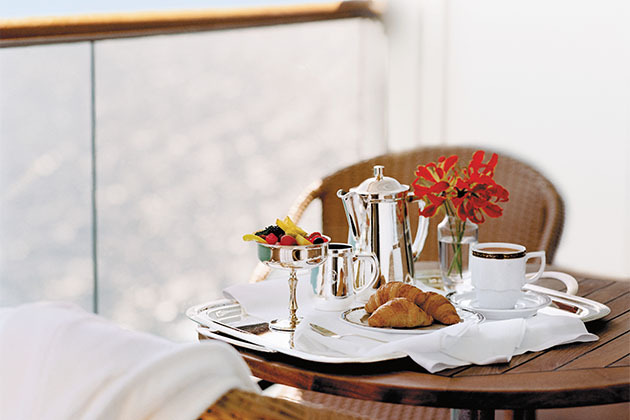 Room service is most often used by cruisers who wish to order breakfast in bed or late-night snacks. What does cruise room service cost? 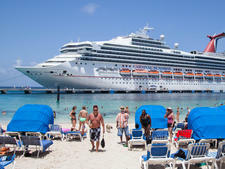 This depends on cruise line policy and might also vary from ship to ship within a particular line. No-fee room service policies generally apply to lines with limited menus (Princess). Other lines only charge for delivery between certain late-night hours (Celebrity). 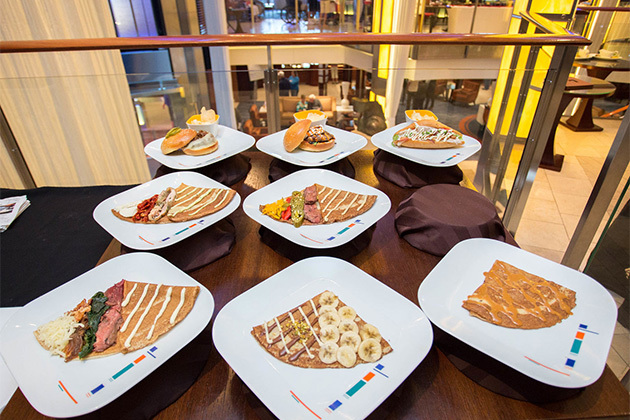 Still others -- usually those with more robust menus -- charge only for certain items, usually hot dishes like quesadillas or chicken fingers and fries (Carnival, Holland America). Meanwhile, there are some lines (Norwegian, Royal Caribbean) that charge for every room service order, regardless of the items chosen or time of day. Unless you have a beverage package that specifies otherwise, all mainstream lines charge for items like soda and alcohol that normally incur a fee. Is room service available on all cruise ships? All mainstream cruise lines offer room service; you're less likely to find it on smaller ships -- particularly river and expedition vessels. Can I order room service any time of day? It depends on the cruise line. Some lines offer 24/7 room service, while others only serve between certain hours. Room service can be ordered by dialing the front desk or a dedicated room service number (if there is one). It's common for room service breakfast to be ordered via menu cards. Passengers use the cards to choose delivery times and check off the items they wish to order. 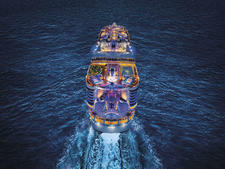 Cruisers then hang their completed cards on the outside handles of their cabin doors at night. The cards are collected by crew, and the food is delivered at the specified time the following morning. Can I order room service from the dining room or alternative restaurants? Generally the answer is no, unless you or one of your cabinmates is ill, in which case food can often be brought to you by a crew member. However, at least one new mainstream ship -- Royal Caribbean's Anthem of the Seas -- is testing this by allowing passengers to order items like sliders from the Michael's Genuine Pub menu for a fee. Additionally, some more upscale lines -- or more upscale staterooms on mainstream ships -- allow passengers to order from the menus of onboard dining rooms and restaurants (including those that charge extra fees) for in-cabin dining. Should I tip the person who brings my room service order? It's not required, but it's generally considered polite to tip a dollar or two to the person who delivers the food to your cabin. Some might refuse to accept the offer, but most will gladly welcome the gesture. What should I do with my tray and dishes when I'm finished? Your room service items will likely show up on a tray with any necessary dishes, condiments and silverware. When you're finished eating, unless directed otherwise, leave everything on the coffee table or desk in your cabin, and someone will collect it later. Leaving dirty room service items in the hallway outside your door is both unsanitary and dangerous, as hallways are narrow, and those passing by can easily trip. How can I learn more about room service? The What to Expect on a Cruise series, written by Cruise Critic's editorial staff, is a resource guide where we answer the most common questions about cruise ship life -- including cruise food, cabins, drinks and onboard fun -- as well as money matters before and during your cruise and visiting ports of call on your cruise.